George Walley with Lakelands Primary School students. LAKELANDS Primary School pupils were treated to a special cultural exchange, learning all about the Mandjoogoordap region through Noongar language and song. 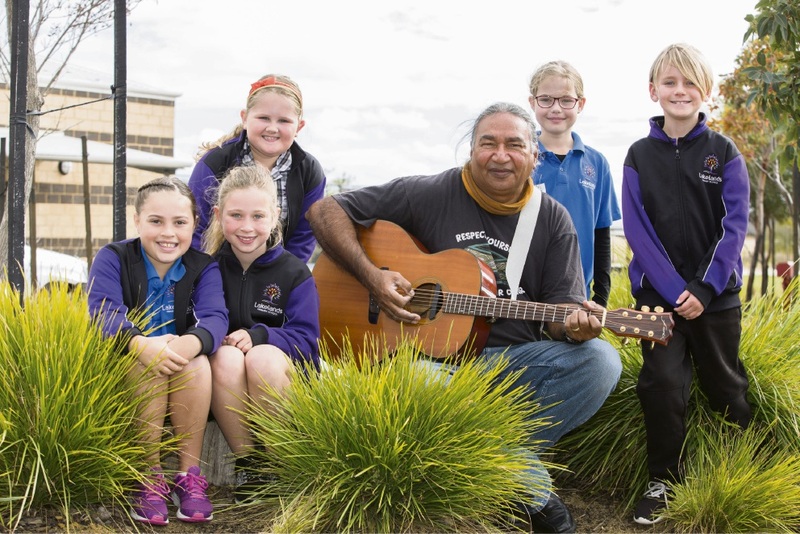 Students from Kindergarten to Year 4 took part in two Culture Through Music workshops held at the school and run by Noongar local and West Australian Music (WAM) award winner George Walley. The junior students took delight in learning Noongar words for local animals and locations, including the meaning of Mandjoogoordap, the Noongar word for the Mandurah region which means “meeting place of the heart”. Part of the school’s Naidoc Week celebrations, the workshops were run with the support of Lakelands Private Estate. Principal James Peletier said the workshops were a great opportunity for students to learn about the traditional culture and heritage of the region in which they live. He said they hoped to work with Walley on the creation of an interpretative walk at Black Swan Lake.